Posted on September 17, 2012 by Julia	by Julia. Are you participating in “Meatless Mondays”? If you are here is a yummy recipe from Taste of Home . I’ve modified it a bit as to make it organic and gluten free. Since we don’t eat gluten we use corn tortillas instead of the flour. 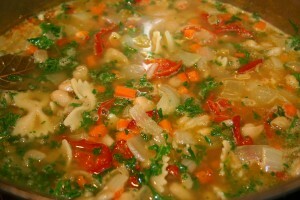 In a large saucepan, combine the first six ingredients. Bring to a boil. Reduce heat; simmer, uncovered, for 4-5 minutes or until thickened, stirring occasionally. Spoon 2 tablespoons sauce over each tortilla. In a large bowl, combine the Monterey Jack, 2 cups cheddar cheese, onions, sour cream, parsley, salt and pepper. Place about 1/3 cup down the center of each tortilla. Roll up and place seam side down in two greased 13-in. x 9-in. baking dishes. Pour remaining sauce over top. 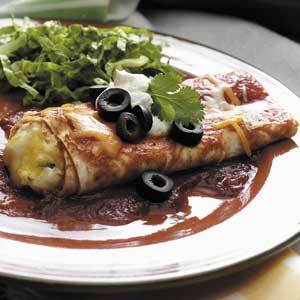 via Cheese Enchiladas Recipe | Taste of Home Recipes.